If you are planning on purchasing an ATS this year, it helps to have an idea of the functions and features of the software that are critical to you, and that is nice to have. 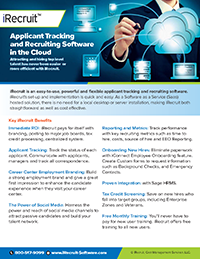 We have put together a checklist of the main features that most applicant tracking software providers offer to help you with your decision. When you attend software demos, you can use this handy checklist to track the benefits of each product you view, as well as add your own notes. iRecruit is a cloud-based recruiting, applicant tracking and electronic onboarding software designed to provide any size of business a cost effective, affordable and simple way to manage the recruiting and hiring process online. We do demos every day, or call 800-517-9099 or click here to ask a question. 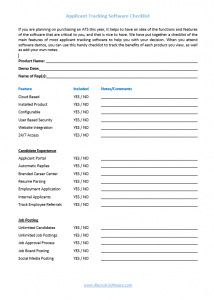 This entry was posted in Blog, iRecruit Blog and tagged applicant tracking software, ats features, checklist, compare ats, comparison, electronic onboarding, iRecruit, resume parsing. Bookmark the permalink.